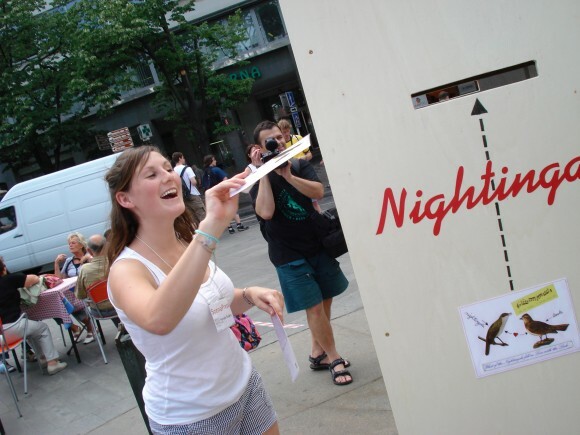 German artist Isi Kunath performed “If the Nightingale falls in love with a Lark” at Wenceslas Square, Prague June 13th. Can you highlight your ideas for us? The idea is to have something real from inside your head. Everyone is sending SMS, email and they speak on the telephone but the problem is that you cannot hold it. They exist but you cannot touch it, all of these things go away. I think it is really good to have something real in your hand from your friends or family. You can keep this is your home, or for 20 years. People must start writing more. I also have the second hand project in the Industrial Palace. I have a table on which I am working with text on clothing, text in theatre and embroidery. I will be doing this for the next ten days. Have you had much response from people on the street? Yes they are really glad, but they do not believe that it is free; they are excited because normally they have to pay. But this is for free. There are very shy people but they eventually write more and more postcards, some wrote more than six! I like that people act in my work, not that I am the actor, my audience are the actors. We are on holiday here for eight days. Did you know anything about PQ or Scenofest? No, we just saw this today, but we would like to know and see more of it. Who are you sending postcards to? My parents, I like these cards they are good, I like the idea of sending these postcards, it is a great success. We have registered with PQ and so the programme told us about this today. It is very interesting being here. Before we arrived we thought it would be an installation or a performance, but when we arrived we were given a postcard and the instructions so I am writing to my family and my girlfriend, even though she is sitting across the table from me. How did you hear about PQ? Through our teacher in Hong Kong, he told us it took place every four years. This was in 2003 so we knew the next one would be in 2007. We planned to come here three years ago! What do you plan to see next? We have some workshops planned; we want to see the fashion show, exhibitions and anything we can. Interview by Nathalie Holman and Michelle Rodgers. Photographs by Tessa Allinson.